Marian "Clover" Hooper Adams was an American socialite, active society hostess and arbiter of Washington, D.C., and an accomplished amateur photographer. Clover, who has been cited as the inspiration for writer Henry James's Daisy Miller (1878) and The Portrait of a Lady (1881), was married to writer Henry Adams. 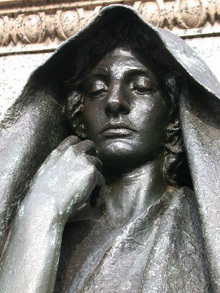 After her suicide, he commissioned the famous Adams Memorial, which features an enigmatic androgynous bronze sculpture by Augustus Saint-Gaudens, to stand at the site of her, and his, grave. After her death, Adams destroyed all the letters that she had ever written to him and never spoke her name or referred to her publicly again. She was also omitted from his The Education of Henry Adams.